Inspiring Interns is a recruitment agency for students and graduates which supports the use of short video CV for their candidates, allowing employers to have a better view of them. The job site provides graduate internship opportunities which last maximum up to 3 months and cover lunch and travel expenses as minimum. The successful applicants are invited to Inspiring Interns’ office to meet and record a personal video CV. Inspiring Interns is one of the UK’s leading providers of graduate internships, jobs and work experience. It works as a recruitment agency that match students and graduates with companies in a wide variety of sectors. Inspiring Interns’ internship vacancies include excellent opportunities such as techie positions with start-ups in Silicon Roundabout, advertising roles at global firms,digital opportunities with growing agencies, entry-level roles with finance houses and a lot more. 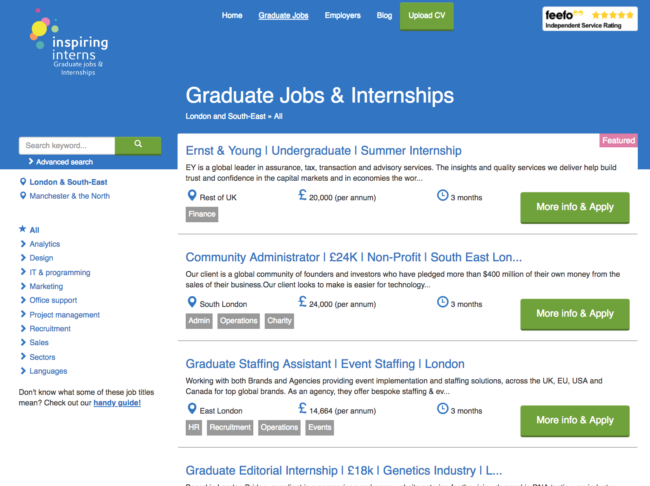 Go back to Internship Category to find more job boards offering internship opportunities for student and graduates.